Michael Woodford continues to do God’s work on the pages of the Wall Street Journal and an in an interview withBloomberg. In the former, he, along with Frederick Mishkin, advance the case for nominal GDP (NGDP) level targeting by showing how the current innovations to Fed policy are effectively a step in that direction. They carefully point out these changes allow for catch up aggregate demand growth while still anchoring long-run inflation expectations, the very essence of a NGDP level target. Woodford further expounds on this idea in his Bloomberg interview. 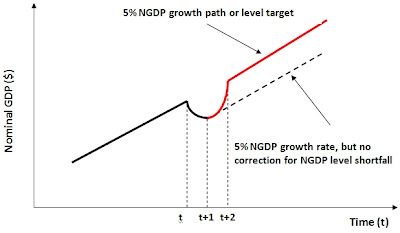 A commitment not to let the target path shift down means that, to the extent that the target path is undershot during the period of a binding lower bound for the policy rate, this automatically justifies anticipation of a (temporarily) more expansionary policy later, which anticipation should reduce the incentives for price cuts and spending cutbacks earlier, and so should tend to limit the degree of the undershooting. Such a commitment also avoids some of the common objections to the simple Krugman (1998) proposal that the central bank target a higher rate of inflation when the zero lower bound constrains policy. And since it ignores supply shocks–e.g it would allow positive productivity shocks to result in lower inflation as long as NGDP growth was stable–NGDP level targeting tends to avoid swings in the stance of monetary policy that can be destabilizing. 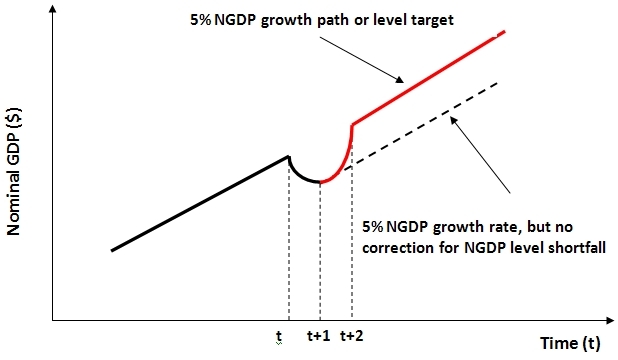 The future of monetary policy is NGDP level targeting. This piece is cross-posted from Macro and Other Market Musings with permission. One Response to "Michael Woodford Continues to Do God’s Work"
Nominal spending would increase even as the inflation rate increases, but is that real GDP growth? It may allow financial lenders to realize a rate of nominal return, and for business to realize a "nominal" expected return, but it does not restore the consequences of aggregate demand shocks. The logic of Keynes' approach is more powerful. This may be a temporary measure to dampen effects from an asset bubble explosion.